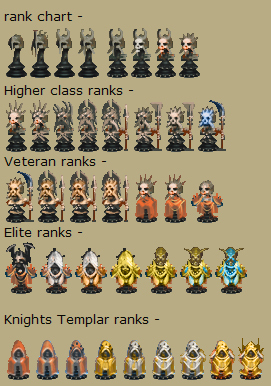 1.1 - everyone starts on basic ranks. 3- light siders take the topic in the battle and put their lighter spin on it, while the dark siders use their dark energies. - posting wips (work in progress shots) of your images into the main battle topic earns you a dogtag that goes into your inventory section. after afew battels if you have competed you should have afew dogtags. 5- ranking, every player has a rank before their name in their teams inventory section, the higher your rank the more you have competed and the more you have shown speed and grace in your art. alternatively, it will cost you 5 pieces of loot, to go up 1 rank, just pm me and say you want to rank up. your rank will increase and the icon next to your name in the inventory section will change to the higher rank. A:there are 100 individual ranks. Q:how do you judge the art in the battels ? A:art is judged useing a multi poll that chaos sets up after ever major battle. - alternatively if chaos is unavailable the Fuzzyeyes studio art team will allocate a winner. winning aside its about drawing and creating something. A: yes just reply to the main battle thread thats active at the time and ask to join, i'l add you to the inventory and there you go. A:yes i have a life, i'm a concept artist at a studio in brisbane australia, i do this because i'm amazed that given the insentive of afew 80 pixel prizes people will creat beautifull art that might not have been bought into the world before, is that a bad thing ? Q: whats the deal with head hunters ? can i become a head hunter? A: head hunters will challenge you for your loots and take your head if they win against you, each headhunter challenge lasts 48 hours and i will post a link here when i have got the challenge list up and running. Basicly you choose from pre defined topics, each topic has 2 parts, one player takes one part , the other player takes the other part, in the end you get 2 pieces of art in the same topic that correspond to another, we choose what piece is better than the other, and the winning player or headhunter gets the defeated players head and loot, then the headhunter goes up in rank. Q: can we choose our own thing to draw for the battle topics? A: the topic is set example : battle 3 = Thunderfalls crossing - the river guardian , you can draw whatever you want as long as it fits the topic, better work gets more loot. A:you can put a link to the art crusade forums or the latest battle into your signature, that will get you extra loot. Q:how long will you run the art crusade ? A:ages if people are still interested. Q: It's possible to change side? A: yes, pm me and i'l change your team, but please dont change teams all the time. A:make a thread, call it "yourname" vs "their name" - post your art into that thread. Q: Is the art to be fantasy based or are the topics open to all genres? Q: can we do futuristic theme ? A: currently i am putting together a second crusade that takes place in a dark futuristic universe, there is masses of loot and armour and mech, it will be abit more complex than art crusade , the project is called The Obisdian War. any adtional questions please post here, if you ask a question i've answered allready please have another read through and ask yourself. Last edited by alti; September 15th, 2008 at 09:41 PM. I'm asking since i saw so many saying in the round 2 thread, "this time in on dark side" or "this time im on light side". Thanks for putting this up, really makes things a lot clearer. Q: will there be a seperate thread for all headhunting duels? Or will each duel have its own seperate thread (this could become messy )? Last edited by yoitisi; January 31st, 2008 at 12:38 PM. Q: why is all this so confusing u cant udnerstand anything even AFTER u red the whole thing? EDIT: is it possible to make like a walk through for dummies tutorial on how this works? 2 - read through the latest battle thread. If I sign up, is it like signing up for a Thunderdome where I need to be prepared to go X rounds completing X pieces? Or is it where a battle starts and whoever is available participates? Just trying to gauge how much of a commitment is needed from participants. Line between "Otherworldly" and "Sci-Fi"? I'm not much for Fantasy, more of a Sci-fi person. I'll do Art Crusades if I can do "other-worldly". For example, if I were to do insect-like humanoid creatures on what looks like another planet, but avoid mech and obviously high-technology, would this be considered otherworldly? Here's another thing: If I were to earn points in art crusade, could I transfer them to the sci-fi one or would I have to start from the bottom all over again? And when will the Sci-fi thing start? ('cuz I might just wait until then). By the way, this is a cool idea! Thanks for putting this together! Been getting myself back into drawing and I think this looks pretty cool. How often do these happen? And are the deadlines just listed in the thread with a new theme? I'd like to join - when's the next one start? Art: is it against the rules?